With notes of nectarine, and bergamot, middle notes are freesia, peony and rose on a base of nutmeg, sandalwood, musk and vanilla. Clean, comforting and dreamy, this is a great every day scent. 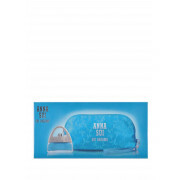 With cosmetic bag.